Tutorial – MP006 Infrared Sensor Breakout « Adafruit Industries – Makers, hackers, artists, designers and engineers! TMP006 Infrared Sensor Breakout @ The Adafruit Learning System. 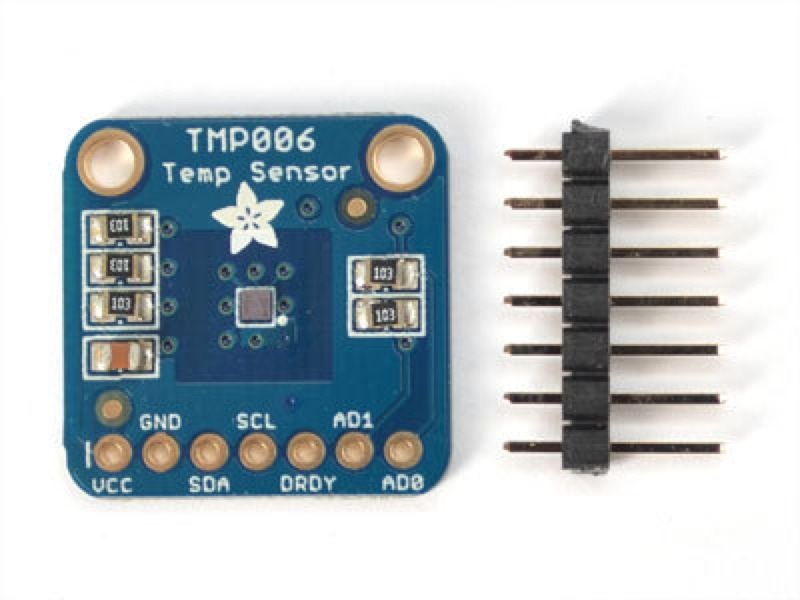 Unlike most temperature sensors, the TMP006 does not require contact with the object it is measuring. It uses a very sensitive thermopile to measure the infrared energy being emitted from the surface of the object. This sensor works best with objects that are good emitters of infrared radiation. The ideal emitter is a completely non-reflective surface or “black body”. Black anodized aluminum or cast iron are pretty good emitters. Polished metal surfaces are very poor emitters, but can usually be turned into a good emitter with a bit of flat-black paint. The TMP006 works with 3v to 5v, so it can be used with most microcontrollers without the need for a level shifter. It connects via the i2c bus and is addressable so you can have up to 8 TMP006 sensors on the same bus.